¿ conectaría bien el mp4 ? Would it he connect well mp4? 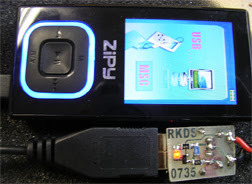 Este circuito indica encendiendo un led, cuando conectemos un dispositivo usb y consuma > 100mA ( consumo tipico en carga de las baterías de mp3(4) PDAs etc ). 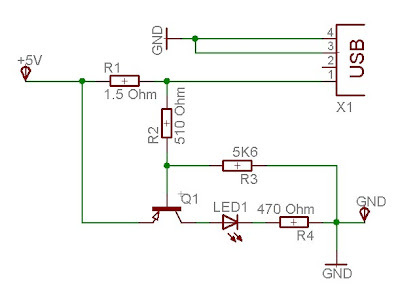 This circuit indicates igniting a led, when we connect a device usb and consume> 100mA (typical consumption in load of the batteries of mp3 (4) PDAs etc). Puede conectarse a la salida de un regulador de tensión de 5Vcc ( mejor 5,5V, ya que en la resistencia de 1,5 Ohm cae tensión, dependiendo del consumo ej. [ 250mA * 1,5 Ohm = 375 mA]). It He can connect to the exit of a tension regulator of 5Vcc (better 5,5V, since in the resistance of 1,5 Ohm it he falls tension, depending on the consumption ex. [250mA * 1,5 Ohm = 375 mA]). Interesante proyecto... se nota que te sentaron bien las vacaciones. I aplogyze to write in english but I'm french and learning spanish is on my todolist ;-). I found your blog by searching something alternative for an UV machine and I'm currently biuilding your project of led UV insulator machine. It's a wonderfull idea. I have just somethnig to say. If you have a bit of time could you try to translate in english your different artciles and projects as the UV machine? We have in mind to translate all the articles, but we haven't more time to publicate more projects and translate it. We need some help to make it. Don't worry, we will translate it in next months. Many thanks for your reply guys. And good luck for all your project!